The Shard is one of London's newest attractions. It opened in 2012 and is the tallest building in Western Europe. The Shard is a beautiful looking building and has a viewing gallery and observation deck that looks awesome (called the View from the shard). Reservations and web purchase of tickets are highly recommended to get in. This lets you skip the lines. If your reservation ends up being at a time with poor visibility, ask about rescheduling. 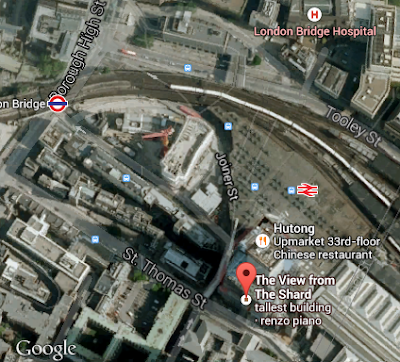 The public entrance is down Joiner St and will feel like it is in London Bridge Station. While the cost of this seems steep it is somewhat in line with other venues - The Space Needle in Seattle is $26, The SkyDeck at the Willis Tower in Chicago is $40 and the Empire State Building with express pass is $64.50. There are some neat features, such video screen telescopes. It will let you zoom in on a feature and it will tell you what you are looking at. 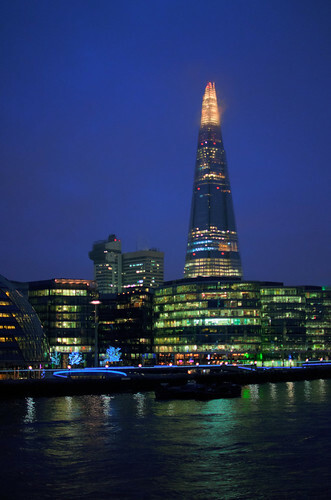 Even so for a family of 6 we will probably pass on the Shard this trip.